Leading Russian Mobile Provider Rolls Out 130 Channels Utilising RGB’s Comprehensive Multiscreen IP Video Solution. Sunnyvale, California – January, 28 2013 — RGB Networks, – RGB Networks, the leading provider of scalable multiscreen IP video delivery solutions, today announced that MegaFon, Russia’s second largest mobile operator, has selected and deployed RGB’s award-winning Video Multiprocessing Gateway (VMG™) and TransAct Packager to provide a complete transcoding and packaging solution for its new over-the-top (OTT) video service. MegaFon launched its OTT service in December 2012 with compelling interactive capabilities to not only respond to the substantial rise in mobile internet users nationwide, but also to retain and increase its 61.6 million subscribers, which represent a market share of 27.1 percent of Russia’s mobile users. This digital TV product was created and is being developed by MegaLabs, a MegaFon innovation arm aimed at launching and monetizing new products and technologies to serve MegaFon subscribers. The implementation was delivered through a key RGB partner and system integrator, the BCC Group. 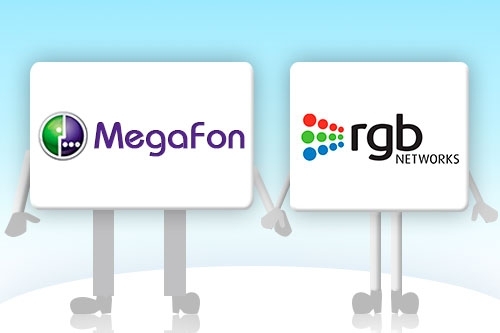 “We received excellent support from both RGB Networks and its partner BCC, who provided us with exceptional service throughout the entire deployment process to ensure that the solution was up and running in record time,” continued MegaLabs’ Starodubov. The VMG’s scalable and reliable multi-stream processing capability represents a sound investment for future-proofing of services and met MegaFon’s requirements to initially facilitate the delivery of high-quality content to iOS devices and IP set-top boxes, with support for Android devices planned for later. With its high performance transcoding capabilities, the carrier-class VMG works in tandem with the critical adaptive streaming functionalities of RGB’s TransAct Packager, enabling MegaFon to seamlessly deliver OTT services to a growing selection of popular end user mobile devices without concerns for supporting growth in channels, resolutions, profiles or device types. MegaFon is a Russian universal telecommunication service provider. Established in May 2002, MegaFon became the first operator with a network covering all regions of Russia. The Company and its subsidiaries have licenses to operate in all of the Russian regions and in the Republics of Abkhazia, South Ossetia and Tajikistan. With over 64 million active subscribers, MegaFon manages the most sophisticated and technologically advanced digital and fixed line network in the country. MegaFon was the first in Russia to launch 3G for commercial operations and is currently in the number one position among all operators in the provision of mobile Internet, and in the number two position as to the number of active subscribers in Russia. In 2012, MegaFon became one of the first operators to launch a 4G network in the LTE standard in Russia. MegaFon is an active sports sponsor and is the Mobile General Partner of the XXII Winter Olympic Games and XI Paralympic Games to be held in Sochi in 2014. RGB Networks enables video service providers to migrate to a multiscreen environment for the delivery of linear and on-demand video over managed and unmanaged IP networks. Wide adoption of the company’s IP video solutions is based on core strengths in transcoding, advertising and overlay insertion, and statistical multiplexing. RGB’s solutions for video delivery to TVs, desktop and mobile devices are built to deliver the highest video quality at the best price-performance on the market—they uniquely offer the density and scalability required to support the growing demands of consumers with integrated functionality that simplifies operators’ network architectures and minimizes operational costs. RGB’s products are deployed by over 400 cable, telco, satellite, OTT and mobile operators in 30+ countries. Venture capital investment firms include Accel Partners, Comcast Interactive, Focus Ventures, Granite Ventures, Institutional Venture Partners, Kleiner Perkins Caufield and Byers, and Mitsui & Co.